The original WeatherCall personal severe weather warning notification system, trusted by hundreds of thousands, is now available in a mobile version. 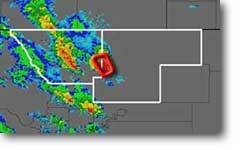 The flagship WeatherCall system continuously monitors the National Weather Service’s NOAA weatherwire and compares a permanent address to the location of the warning area polygon, immediately calling any type of telephone to deliver a specific warning message. 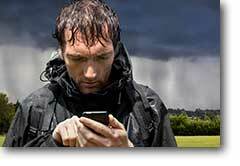 Different from ALL other mobile weather products on the market either free or fee-based, WeatherCall ToGo's "Follow Me" capability makes it the only user-centric personal storm warning service available anywhere. Using the same technology, WeatherCall ToGo 1.4 monitors the continuously updating location of a smart phone and delivers a warning notification via a phone call, SMS text, or email if the phone is within 1 mile or less of an NWS warning area. With the touch of a button, the user can see a Google map of their position and view the warning polygon or can read the full text of the warning. 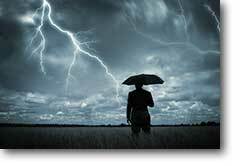 Stop taking chances wondering whether lightning is too close to you. An optional subscription to lightning notification provides a virtual 6-mile safety radius (recommended by NWS) around your smart phone's reported location. When the first lightning strike inside this circle occurs, you are notified immediately by either phone call or SMS text to suspend activities and seek shelter in a safe place. After the lightning-producing storm has exited your 6 mile safety zone, you can choose to receive an "all clear" notification after either 15 or 30 minutes. The WeatherCall ToGo, WeatherCall Lightning, and WeatherCall ToGo Plus services perform optimally on smart phones which can receive SMS text messages, and have location capabilities, such as the iPhone and Android platforms. NOAA’s NWS storm-based warning calls: $11.95/year Sign up now! Simply start the WeatherCall ToGo application and keep it active in your browser window for continuous monitoring for weather warnings affecting your current location. The phone will ask permission to use its current location after which it will report its lat/long to the WeatherCall servers once per minute. When an NWS storm-based warning is issued within 1 mile of your phones reported location, a warning call and/or SMS text alert will be made to your phone. Touch on the warning icon to display the full warning text and a Google map displaying the warning polygon so you know EXACTLY where you are in relation to the danger. The warning can also be delivered via email. Real-time lightning strike monitoring: $11.95/year Sign up now! WeatherCall Lightning monitors a 6 mile radius “protective zone” around you. When lightning strikes are detected within this zone, a warning call will be made to your phone with a recommendation to temporarily suspend activities. Fifteen minutes after the last lightning strike has been detected within your protection zone, another phone message will be delivered indicating that it appears safe to resume activities. The information can also be delivered via email or as a SMS text message. WeatherCall ToGo plus WeatherCall Lightning: $17.95/year Sign up now! When you subscribe to our bundled offering which includes both WeatherCall ToGo plus WeatherCall Lightning, you not only have the ultimate peace of mind when any type of severe storms are brewing, but you'll also save money! Copyright © 2009, 2010, 2011, 2012 Media Weather Innovations, LLC. All rights reserved.